This was destined to become the climb that ended the dreaded "Crawford Path Curse," a 2-1/2 year stretch of failed summit attempts when starting from the Crawford Path Trailhead. But alas, the glory of my success was to come much later in the trip!. From the beginning, I was off to a bad start. Intending to leave home at 4:30 AM, I slept through my alarm and didn't get out of the house until after 6:30, putting a huge dent in my plans for a long 12-hour hiking day. 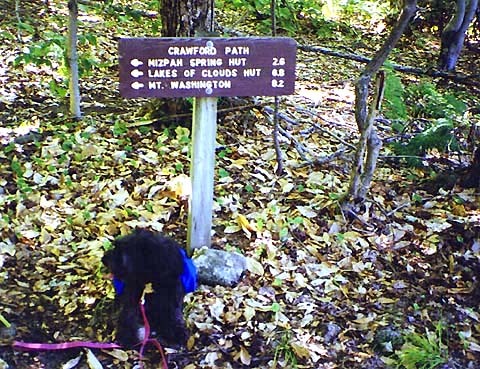 After a frantic drive up to Crawford Notch trying to regain some of my lost time, Muffin and I finally hit the trail around 9:30. 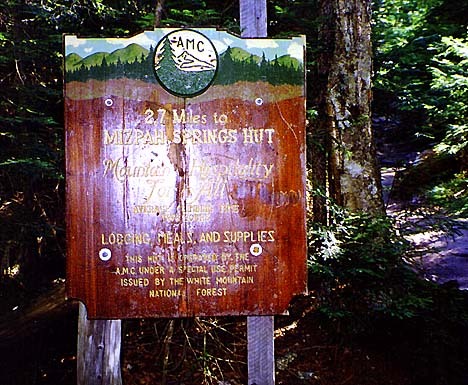 My original plans were to hike up and over Mizpah Hut down to the Dry River, set up camp, then summit Mt Isolation via the west branch of the Isolation Trail and Davis Path and return to our campsite. 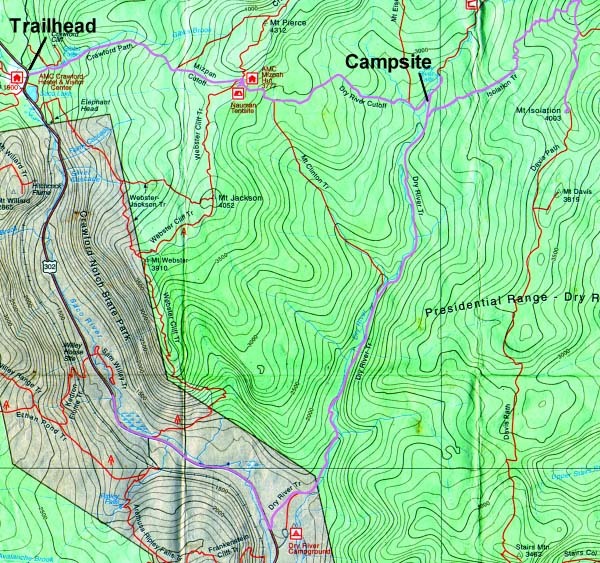 The next day, I had planned to hike out via the Dry River Trail, then ascend Mt Willey via the Ethan Pond and Willey Range Trails. Now I doubted that I'd have time to make Isolation and return to our tent by nightfall. But I'd have to play it by ear and see how it went. Not far up the trail, we stopped briefly at Gibb's Falls. I had expected more of a show, but the thin trickle of water was a bit disappointing, so I just took a quick photo and continued on. Muffin was having a great time running up and down the trail as we walked along. Muffin by the Crawford Path Trailhead. I'd been up this trail from Rt 302 several times before, but never in the summer. It was nice to see the trail without snow. 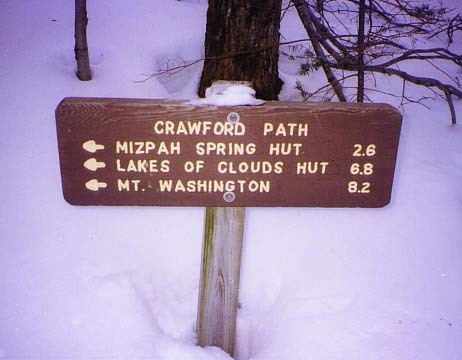 Mizpah Hut sign. I think that this is one of the most interesting trail signs in the White Mountains. 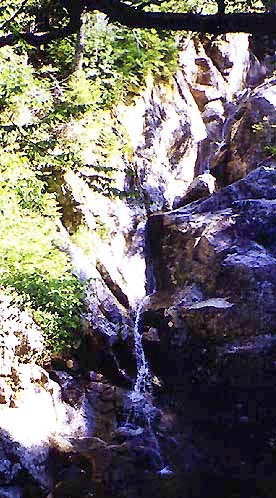 Gibbs Falls. 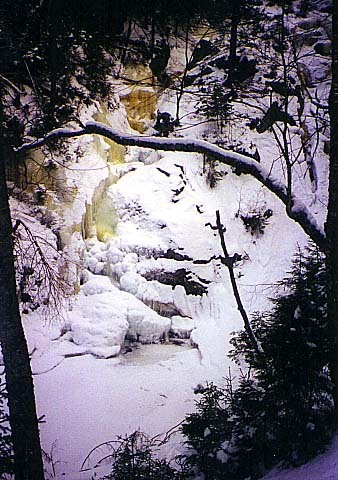 After seeing these falls only in the winter, I had expected that they might be more impressive than they were. Perhaps they are best in the late spring.